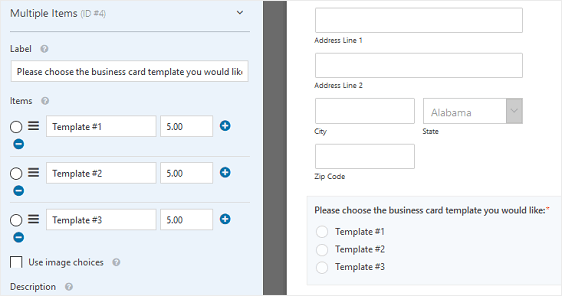 In this article, we’ll show you how to create an business card order form using the WPForms image choices feature so you can give people the best buying experience possible. The first thing you’ll need to do is install and activate the WPForms plugin. If you need more details, check out this step by step guide on how to install a plugin in WordPress. Next, you’ll need to create a new WordPress form. For detailed steps, see our tutorial on creating a simple order form in WPForms. The default order form comes with Name, Email, Phone, Address, Available Items, Total Amount, and Comment or Message form fields. In order to change and edit these fields, you’ll need to open the Form Editor. Then, click on the field you want to edit on the right hand side, and make your changes in the editor on the left hand side. In this example, we’ll change the Available Items field. We are going to offer people 3 business card options, complete with image choices so they know exactly what they’re getting when they pick an option. To do this, change the Available Items label to something like: Please choose the business cared template you would like. Then, add business card template names for people to choose from and the corresponding prices. 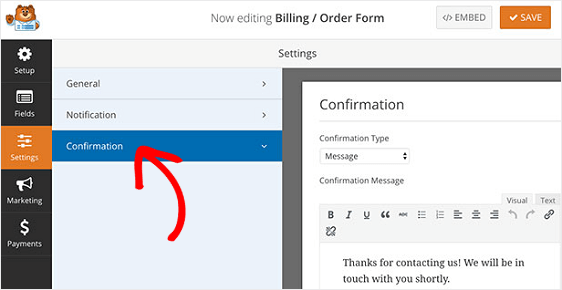 You can also add or delete any additional order form fields you want to by clicking the + and – signs. Keep in mind, this is a lot of information for people to fill out all at once. Especially because you’ll also need to collect delivery and payment information. That’s why having a multi-step form ready for people to fill out is a good idea. For step by step instructions, read about how to create a multi-part form in WordPress. The next thing you’ll do is add images of the business cards you want available for people to choose from. To start, click on the use image choices box to enable this neat feature. You can now upload your business card templates in the Available Items form field. Just click on Upload Image and choose the images you want to add for each individual item that’s available for purchase. When you do this, you’ll notice each image you upload appears on your working form, so you can make sure they look like you want them to. Next, you’ll need to put the final touches on your business card form. 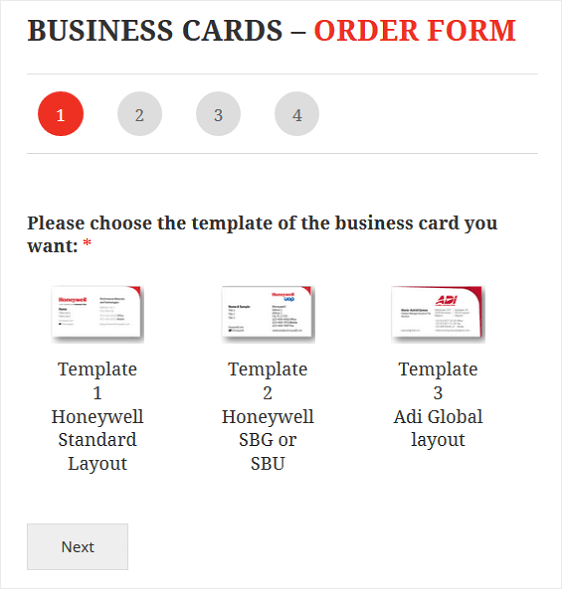 There are three order form settings to configure before your business card order form is ready for your website. The first is a form notification. Click on the Settings tab in the form builder and click on Notification. Here you can customize which email addresses receive notifications about order form submissions. You can also add multiple form notifications to send your customers an email receipt after they’ve made a purchase. Next, click on the Confirmation tab to customize the message people will receive from you once they submit their order form. You can also redirect them to a thank you page if you want. Now you need to connect to your payment provider so you can collect payment from your customers for their business card orders. WPForms integrates with PayPal and Stripe for accepting payments. You can also set up your business card order form to give customers a way to pick the payment method they prefer. For help with this step, check out our tutorials on accepting payments via PayPal and Stripe, depending on which payment gateway you prefer. Lastly, you need to embed your form onto your website for customers to view and order from. Check out this real-life example of a business card order form using WPForms for you to gain inspiration from. And there you have it! 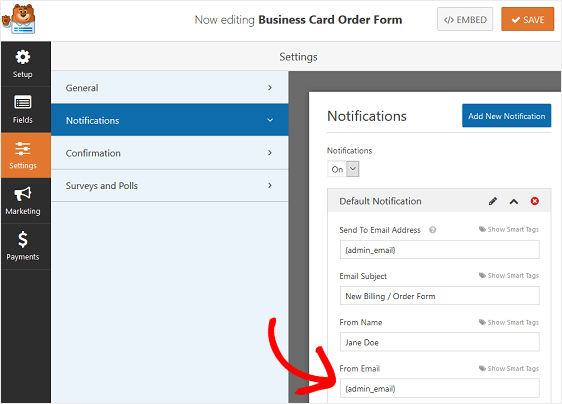 You now know how to create a business card order form using the image choices feature in WPForms. And the great thing is, you can apply this same concept to any order form that would benefit from having image choices during the purchase process. If you’re looking for an added bonus, and want to boost your email marketing efforts, try adding a MailChimp signup form checkbox, or an AWeber signup checkbox form to your WordPress form so they can subscribe to your newsletter while making a purchase.